The Pelicans is a pretty bad name – but you actually do see them all over Nola and they’re scary in a prehistoric kind of way. I heard that the name New Orleans Brass was floated out there during the rebranding and that would have been great. Jordan definitely dealt the No. 1 pick for the rights to the Hornets. There’s no mistake. It was one of David Stern’s last tasks on his to do list before leaving the NBA. I’m not sure I can handle the thought of making anyone wear a Bobcats jersey. 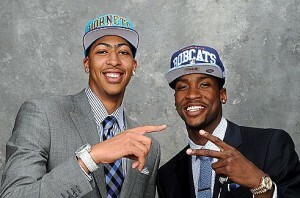 Yet, I’d gladly deal with the old moniker to watch Anthony Davis on the court. I mean, the Hornets had Spencer Hawes out there to close out games. So far, the rebrand has only sold a few shirts and the team’s back to playing like Bobcats.